RC airplane clubs just may be the best places on earth. A group of guys spending the entire day tinkering, flying, and yes...occasionally crashing their planes. I mean seriously, can you think of a better way to spend your Saturday? Want to be successful at learning how to fly RC airplanes? Stop by the local club and introduce yourself to some of the friendly folks you'll ever meet that share your interest and passion for model aviation. I promise, it will be the best move you could possibly make. You'll quickly learn that these guys go out of their way to help newbies learn to fly. Most all RC airplane clubs have a couple of buddy boxes lying around. A buddy box gives the instructor the ability to take control of your airplane should you get in trouble on those first few flights. Heck, our club even has a dedicated training night for the new guys. The club trainer is available to give curious people a taste of what it's like to fly an RC airplane before investing a bunch of money. So what's at an RC airplane club? 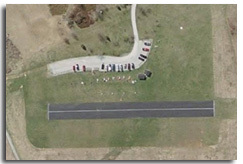 Our's has a nice 500 foot by 50 foot landing strip with five pilot stations. At one end of the runway there's a little shelter where the frequency pins, chargers, and various equipment are kept. Makes a great place to get out of the sun on a hot day too! Behind the pilot stations are wooden tables for tinkering with our planes. And of course, we have a windsock so we can tell where the wind's coming from. You have to be extremely careful considering the airplane we fly have the ability to do some major damage. This is especially true in a public place with a lot of people around. The quickest way for even the most experienced pilot to loose control of an airplane is when someone else's radio transmits on his frequency. It's crucial for the folks that still use the old 72Mhz transmitters to use the frequency board to keep track of who's using what channel. Yell "Taking Off" to notify other pilots when you're about to take off. When landing yell "Landing" or if your engine quits yell "Dead Stick!" so the others can try to get out of your way. Make sure not to fly behind the flight line over top of peoples' heads. It's important to stay within the flight boundaries outlined by the club rules. For some reason, people don't seem to appreciate it when a random plane comes crashing down in their backyard. RC airplane clubs in the United States require that you be a member of Academy of Model Aeronautics(AMA) before you can fly. The AMA does a lot of great things for our hobby, but liability insurance is the reason that clubs require AMA membership. As long as you are abiding by the AMA safety code while flying, the AMA will cover any damages up to $2,500,000 if an accident occurs that hurts someone or causes property damage. Every club has annual dues that are used for maintaining the flying field and to pay for various flying events throughout the flying season. I am sure the dues for every club varies. My club's annual dues are $70. AMA membership is currently $58. So you can expect to pay around $130 per year to be an active member in your local RC airplane cub. 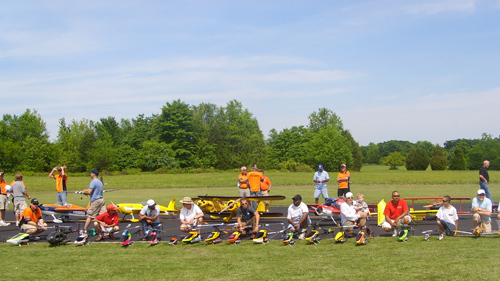 RC Airplane clubs can be a great asset to the community. Our club has an annual "Wings for Kids Air Show" where some of the best RC pilots from around the country come and put on a heck of an RC air show. It's an awesome time that the club looks forward to each year. Every penny of the proceeds go to a charity that helps children. Are you ready to find a club? If you live in the United States just click this link to find a club near you. If you live somewhere other than the U.S., check your local hobby shop.